How do I edit my profile and user information? I forgot my password, or lost it, what can I do? How do I upload something to the download area? What is a Test Subject/Field Researcher etc? Why do I have it under my name? Who are the mods? How do I become a mod? What is this yellow triangle next to my name? #2 29th Oct 2014 at 06:40 PM Last edited by HugeLunatic : 29th Oct 2014 at 09:28 PM. If you are under the age of 18, you are NOT allowed to use this board. #3 29th Oct 2014 at 06:41 PM Last edited by HugeLunatic : 9th Dec 2014 at 03:23 AM. When you register, you will be given the option to 'Automatically login when you return to the site'. This will store your username and password in a cookie, stored on your computer. If you are using a shared computer, such as in a library, school or internet cafe, or if you have reason to not trust any other users that might use this computer, we do not recommend that you enable this. This forum also gives you the option to use a cookie to track your current session, ensuring that you remain logged-on while browsing the site. If you choose not to store this information in a cookie, the session data will be sent through each link you click. Choosing not to use a cookie may cause problems if your computer's connection to the Internet uses a proxy-server and you share links with other users behind the same proxy. If in doubt, we recommend that you select 'yes' to enable the cookie. After you have registered, you may alter your cookie options at any time by changing the settings on this page. #4 29th Oct 2014 at 06:41 PM Last edited by HugeLunatic : 9th Dec 2014 at 03:23 AM. Why don't my uploads show under my profile/in the Downloads section? You do not yet have 10 thanks on your uploads. They won't show up under your profile until you've been thanked 10 times. That shouldn't take long. To check whether it's actually there, click on "Find threads started by (your name)" on your profile and you should see the post listed there. You have uploaded something that requires expansion packs, and you do not have those expansions set as owned under your profile. User Tools (in the blue bar at the top of the page), Edit Profile, and fix your Games Purchased to reflect those that you own. If it's an item that's moderated, like recolours, sims, or houses, it needs to go through the moderation queue and be approved before it'll show up. You'll automatically be subscribed to your own uploads. At the top of the page click User Tools, Subscribed Threads to see your thread subscriptions - items still in the moderation queue have a note saying they are awaiting moderation. How do I set custom colours for my profile? You can create your own theme using theme generator. Not feeling particularly creative? Then try using one from the theme sharing thread! To set your profile to use a custom theme, go to User Tools - User Control Panel - Edit Options. Scroll down to "Custom Themegen Style" and enter the theme id. Then, go to User Tools - User Control Panel - Edit Profile; scroll down to "Profile Customisation Options" and select the custom theme id. How do I add a banner to the top of my profile/uploads? Profile pictures (banners) are reserved for featured creators, Moo-Moo Award winners, MOCCA Award winners, and LATTE award winners. If you fall into one or more of the above categories... to set it, go to User Tools (again, top bar), and then click on User Control Panel. Once you're in the UCP, click on "Edit Profile Picture" under Settings and Options on the left side of the page and upload your image. The maximum size of your profile picture is 768 by 90 pixels or 293.0 KB (whichever is smaller). How do change my user title? Custom user titles are reserved for moderators, special users (chosen by moderators) and monthly donators. Otherwise, user titles are based purely on post count and really, they don't mean anything. Why can't I start a journal? Journals are reserved for creators with 1 or more uploads. New journals are moderated - the journal will need to be approved by an administrator. Subsequent journal posts are not moderated after your journal is approved. How do I change the position of where my journal shows on my profile? By default, the journal will show on the left of your profile. If you would like to change it so it shows on the right, go to User Tools - Edit Profile, and scroll down to "Show Journal on right side of member profile" and check the box there. How do I set a profile title? User Tools - User Control Panel - Edit Profile. Scroll down to "Customised Profile Title" and enter the text you would like to display at the top of your profile page. User Tools - User Control Panel. Settings & Options - Edit Profile - "About Me / Profile Box Title" and enter a title or heading. You MUST enter a title or heading in that box for the text below to show up! Then, enter your details in the box below, labeled "About Me / Policy / Other Text." You can use standard vBulletin tags to make lists, italic, links, etc., in this area. You may use images in this area, as shown here but please keep these images to a reasonable size... no larger than 600x600 pixels. You may find your "About Me / Policy / Other" info cleared by an administrator if you go over this limit. Underneath your username, avatar, etc. when you post, a small line of text will say something like "313 Thanks in 10 Posts" - it often happens that the post count there will be incorrect, displaying a much higher count of thankable posts than you actually have. This is a small known issue and you can easily fix it yourself. First, go to your own profile. You can find it by clicking on your name where it says "Welcome, Username," in the navigation bar at the top of the page. Then click the link under your name and avatar that says "View My Scorecard." Your scorecard page will load (this may take longer than other pages as it's having to calculate things), and in doing so, your number of posts will also be recalculated, and the glitch will be fixed. 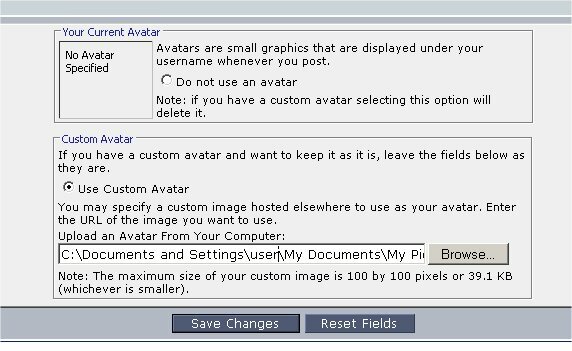 To upload an avatar (the little pictures that appear under peoples names), click on Quick Links in the top right, then click on Edit Avatar. You have to have the file you wish to use on your PC, and then upload it. 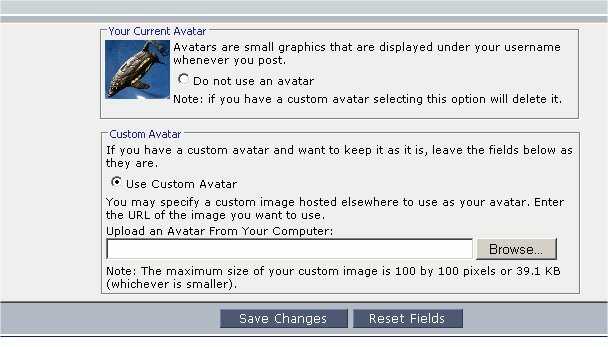 Remote (offsite) linking of Avatars is not allowed. 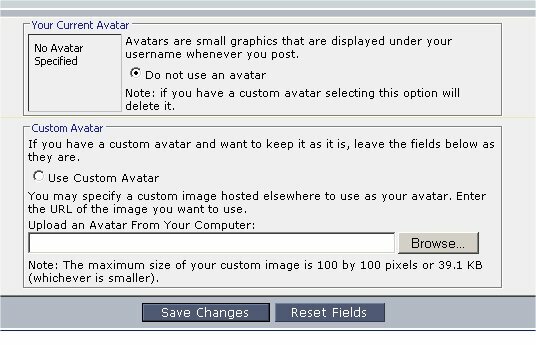 Please see http://forums.modthesims2.com/showthread.php?t=32902 for the specific rules regarding Avatars. If you get a message that your IP doesn't match our records, simply send the e-mail that is generated. DO NOT delete anything and send the e-mail from the e-mail address that we have on file. IP addresses may change from time to time, especially with your ISP, and especially if you're on dial-up. However, if you happen to get a new one and we don't have it already logged, don't be alarmed. Simply request a new password and we'll take care of that for you. 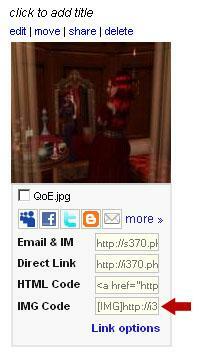 Also, make sure you add modthesims2 -at- gmail.com (replace -at- with the @ sign) to your contacts. Check your junk mail / bulk mail folder for any emails from us. ONe last thing, DO NOT create another account simply because you can't get signed back in. Multiple accounts are not allowed... and that just makes more work for everybody. THANKS. Make sure you're aware of MTS's Picture Guidelines in regards to dimensions, file size limits, etc. Remember, no larger than 1280x1024px, 250 kb, JPG or GIF. Photobucket - Registration is required. Tinypic - No registration is required. Imageshck - No registration is required. If you got a photobucket, you'll need to log in first. 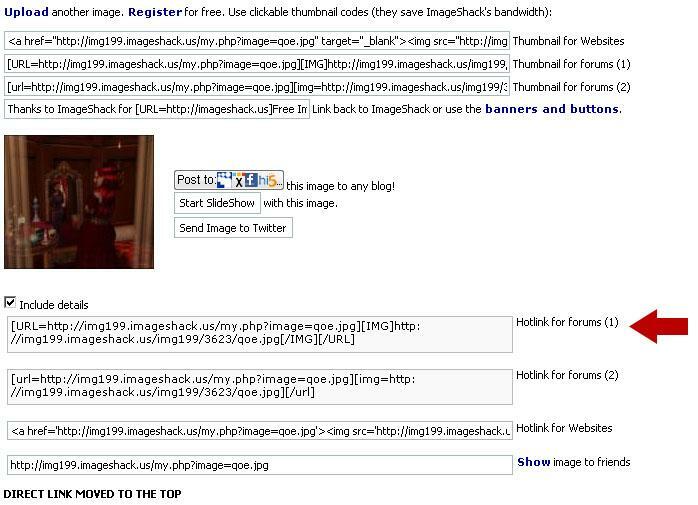 Go to the image upload area (it's on the front page of Imageshack and Tinypic) and click Browse. Find the image on your computer, and select it. Then upload using the upload button. 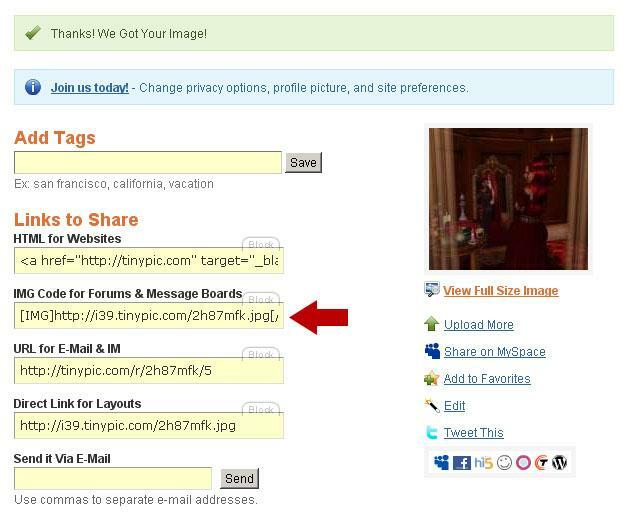 Paste the link you copied in step 4 into the text of your post and submit your post! Of course, you can do more than one image the same way. - This will take you to the upload form. - Follow the Creator Guidelines and the instructions on the screen! Files posted for download require approval by a moderator in all sections. If your new thread has not appeared, it's probably waiting to be looked at. As this is done manually, on a case by case basis, this can take a little while. It will be either accepted or rejected as the moderators judge. If rejected, you will receive a PM (Private Message) notification on the site. These are the titles on the forums. They change according to the number of posts you have. Since MTS2 is about the Sims 2, we felt it would be fun to have actual Sims 2 career tracks as the member titles. You'll have to find out the rest Please not that somebody with "Instructor" under their name does *not* necessarily mean that they will answer questions. It's just a title. The MTS staff team, made up of the moderators and the admins, are responsible for keeping MTS running - that entails keeping an eye on threads, answering questions, moderating uploads, dealing with rule breakers; as well as bigger tasks like writing FAQs and modding updates, discussing and eventually implementing new features, systems, forums and so on. All staff members are volunteers, working on the site in their spare time; and we have quite a small team - generally around twenty or so staff members at any one time. What do the different colours mean, or what flavours of staff are there? Staff with light green names are moderators. Moderators generally have duties, and therefore powers, in one or two specific areas of the site - perhaps the help section, or the community boards; or a particular part of the Downloads area. Moderators generally look after the everyday runnings of their particular section - answering questions, nudging threads back on topic, moderating uploads etc; although all staff participate in general staff discussions about the site as a whole. Staff with dark green names are Senior Moderators. Senior Moderators have the same powers as normal Moderators; but are considered to be among the most experienced and generally awesome of the moderators. Staff with purple names are Super Moderators. Supermods have moderator powers everywhere on the site - that is, they can move, delete, and lock threads etc in any section of MTS. Supermods can also deal with users anywhere on the site - so if you're having troubles with a user in more than one thread/area, a supermod or an admin is a good person to talk to. Similarly, supermods can generally answer questions about the site in general - although it's usually better to post these in Site Issues. Staff with red names are Administrators. Administrators can do pretty much anything in technical terms; and are, again, capable of answering questions or complaints about the site, and of dealing with users who need a smack upside the head. Staff called Delphy are the Owner. They are a very rare breed; sightings are few and far between as they are usually well hidden behind curtains of code and acronyms. Delphies are the sole staff members responsible for coding all the gubbins on the site, and for looking after the servers. Site Helpers are not staff members. Helpers are users who have agreed to dedicate time to helping out around the site - perhaps by updating and tidying the wiki, or by providing constructive feedback in the Creator Feedback Forum, or by greeting new members in the Introductions forum. They are not, however, moderators; they don't participate in staff discussions, and they do not have any mod powers (like locking threads). There is no "application process" for becoming a mod on MTS. If we decide that we need an extra pair of hands in a certain area, then we look at the members who use that area. Any who stand out as consistently being helpful, constructive, level-headed and polite are picked out and discussed. If all staff members are happy with the prospect of that being person being a moderator, then they are made so. If you have modly ambitions, then the best thing to do is to be a helpful member - even if you're not asked to be a mod, your help will be greatly appreciated. If you receive a PM from site staff then a yellow triangle appears next to your name/pm box in the menu bar. It doesn't always go away even when you read the pm.